Summer is an awesome season, we have so many different fruits that are available to us either from the store or fresh right from the farm. I haven’t had the chance to go strawberry picking yet, but a couple of years ago with my husband and some friends we had enjoyed a very nice day at a farm picking Blueberries. The great thing about a lot of these fruits is that we can get them fresh and have them available to us all year. I like to get out to the local farms in my area and buy a larger quantity of some of the fresh fruits and clean, cut into chunks and freeze them. A lot of the smoothies, lassi, milkshakes and drinks tasty much better with frozen fruits. For this one I used fresh strawberries, since I had some hanging around in my fridge that needed to be used up right away! 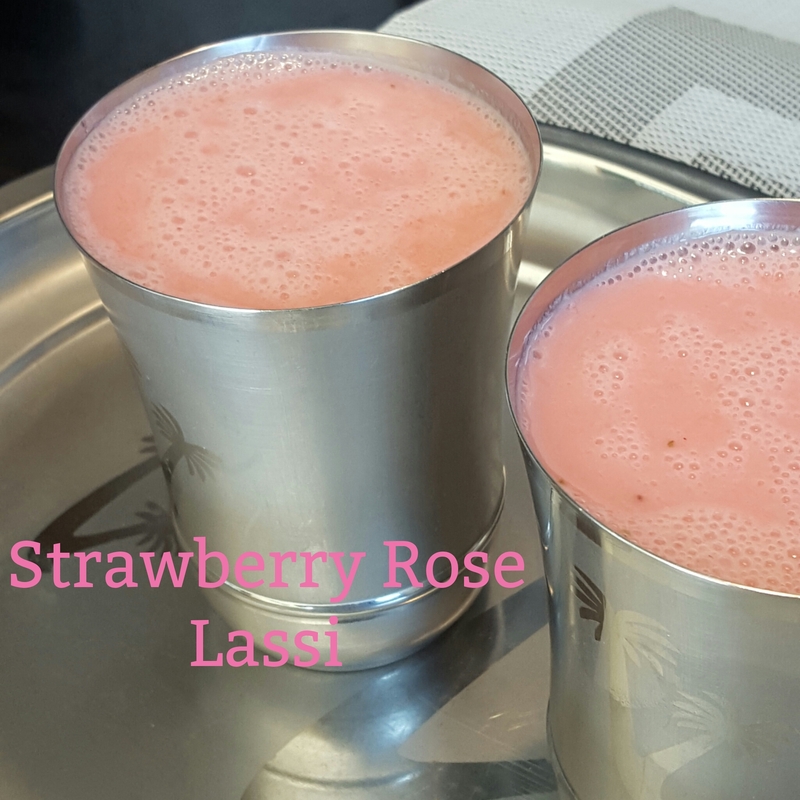 Strawberry Rose Lassi, is a very smooth, creamy tasting drink. I used a Rose Syrup that I bought in our local Indian grocery store called “Kalvert Rose Syrup”. I like using this brand it doesn’t have a very strong rose essences smell or taste, but again you can use any rose syrup of your choice. This easy and quick four step yogurt drink is ready in no more than 10 minutes. This is another one of my non-recipe drinks, there is no right way to follow. Just go with your liking and taste. All it takes is strawberries, yogurt, rose syrup,cold water into a blender and then into your favorite glass to enjoy ! My favorite glass for this drink is a traditional Stainless Steel glass tumbler style which are widely used in every household in India. I use them in my house for this special drinks and to serve water to my guest. 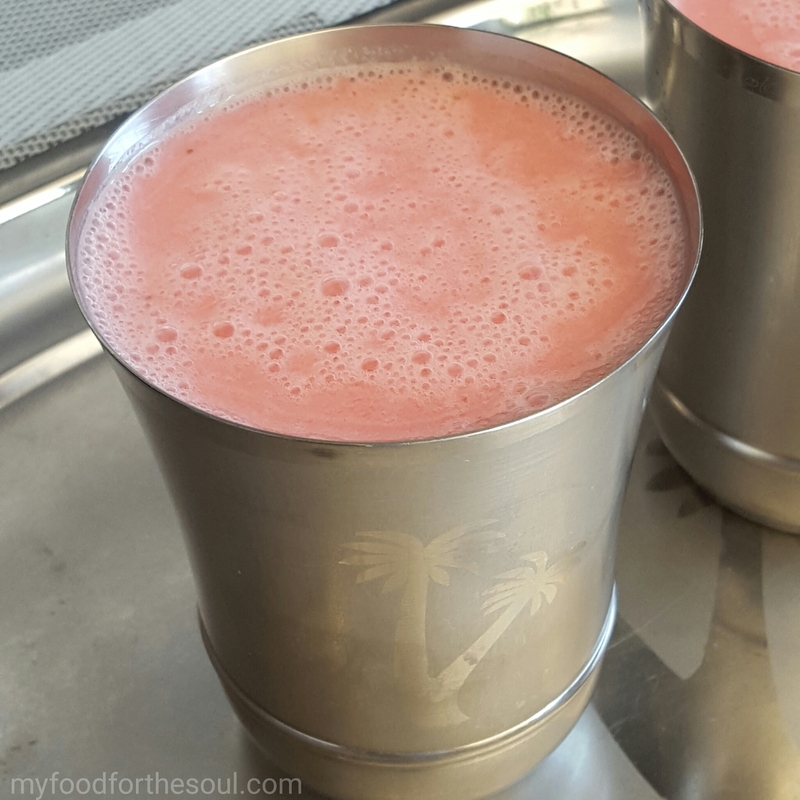 Be sure to check out some of my other refreshing and cool drinks to enjoy in the summer time or any time: Mango Lassi, Mango Banana Milkshake, Strawberry Banana Milkshake, Mango Melody Smoothie, Orange Papaya Smoothie, Fruity Treasure Smoothieand Masala Chaas. 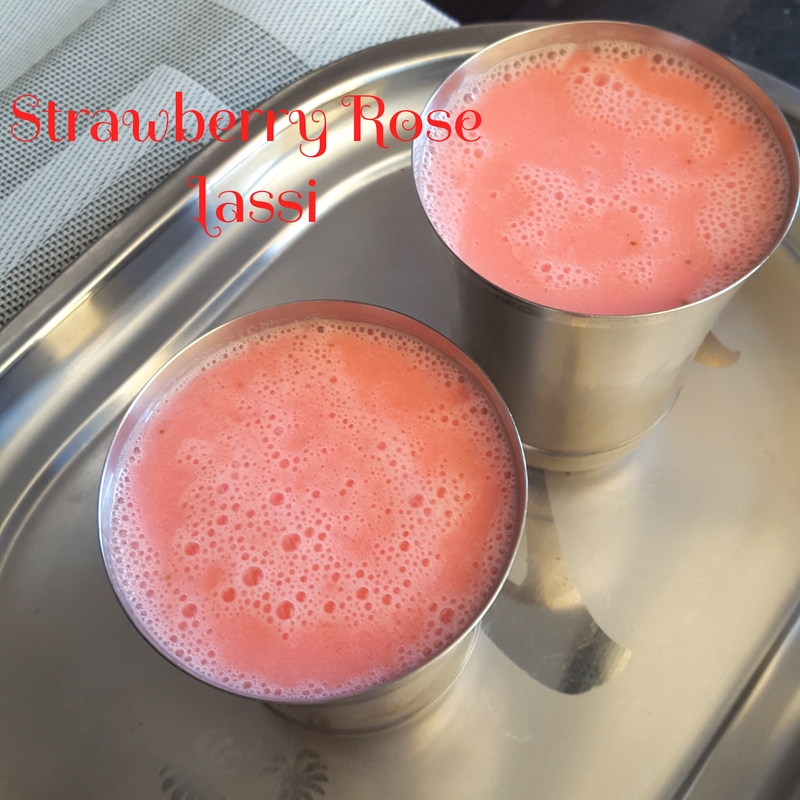 Nice refreshing cool drink with the goodness of strawberries, yogurt and rose flavor. Place all of the ingredients into a tall blender. Blend for 5-6 minutes till a smooth creamy consistency reached. Adjust consistency by adding more cold water. Pour and serve in desired glass ! use your choice of rose syrup.